So Yesterday was a fantastic day for me! 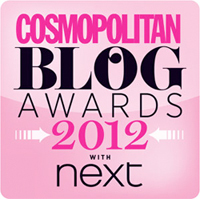 I found out KAKA Beauty Blog made it to the shortlist for the 2012 Cosmopolitan Blogger awards! I am over the moon! Ecstatic isn’t even close to describing how I feel! I would like to thank each and everyone who nominated me for the Best new Beauty Blog category! Never in a million years did I think I’d actually make it through amongst the 1000’s of other brilliant bloggers! This proud moment has really reminded me why I love blogging and the supportive blogger community so so much! I’ve been pretty hectic lately with a new business venture and stress of general life but this one joyous piece of news has brought a massive smile to my face! So again thank you all! So after the last mad few weeks of nominations, now before we can sit back n relax, the nail biting tension starts all over again as we wait to find out who wins! haha! Thanks for reading guys! If I haven’t said it already THANK YOU to everyone who nominated! You are the BEST! Tags: Best New Beauty Blog, Blog, Blog award, Blog awards 2012, blogger, Cosmopolitan UK. Bookmark the permalink. Aw thank you! Thats really sweet! I’m glad you like my blog it means a lot! :) Thank you! LOLLL at this post! I surprisingly laughed at this as its ridiculous lollll but love it though haha!! SUPER jealous yet SUPER proud!!! you deserve it! !